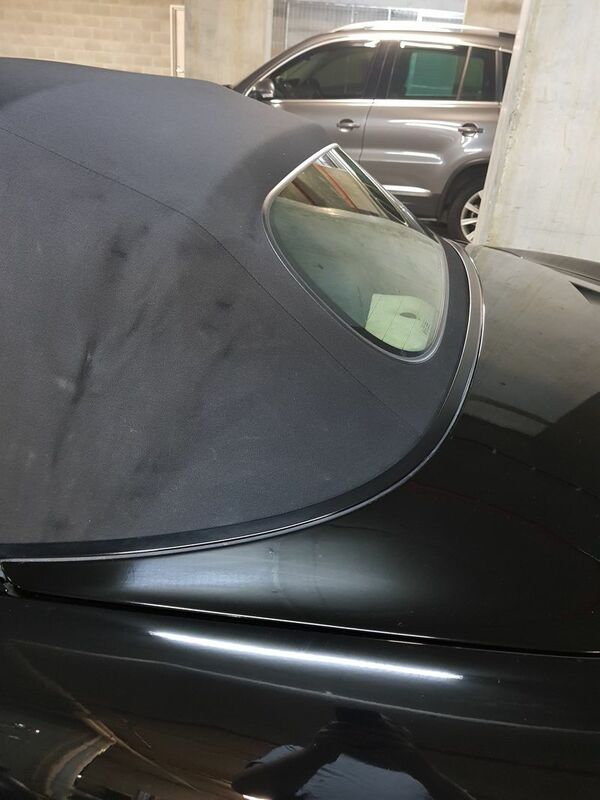 My car's a '97 but I fitted an '03 glass roof a year or two ago. 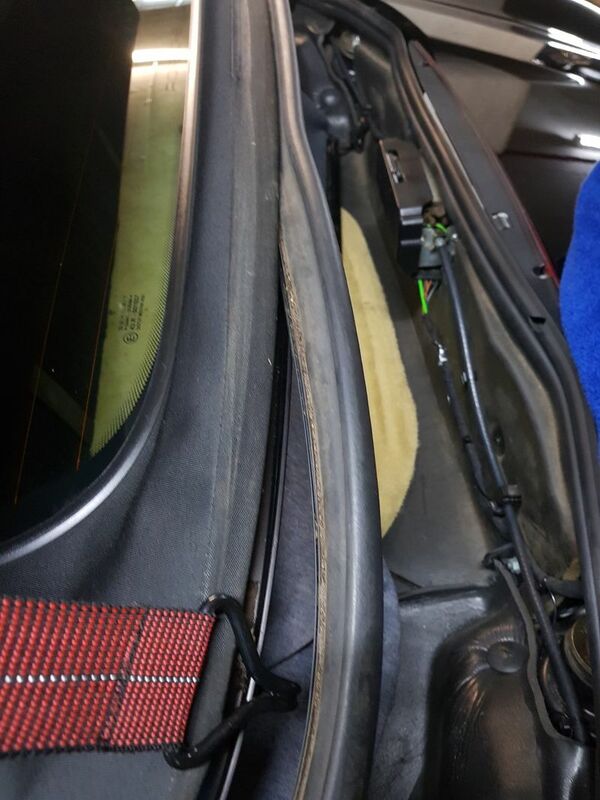 With the top in the service position you can see the problem, the rear canvas has pulled out of it's original folded position, allowing slack in the back part of the roof. 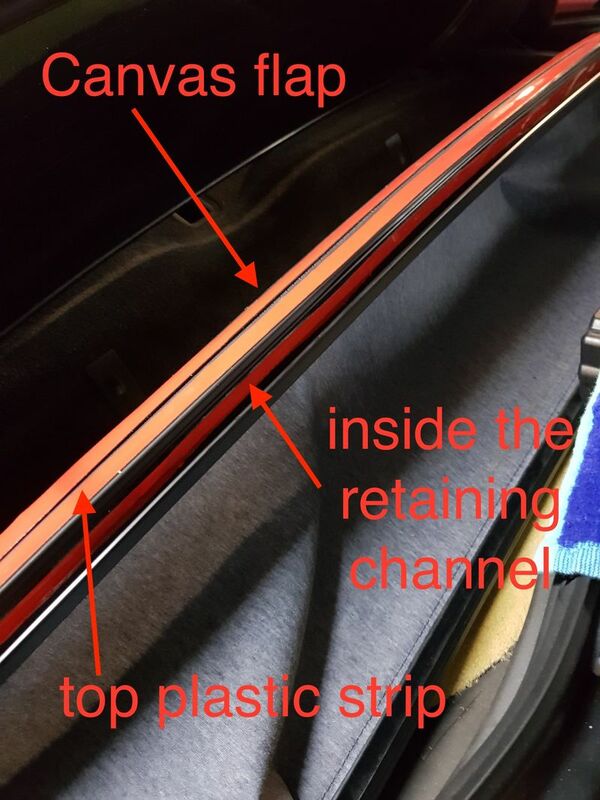 Start with the top in service position by pulling up the rubber strip from one side. Note the inserted part goes further than the visible part. 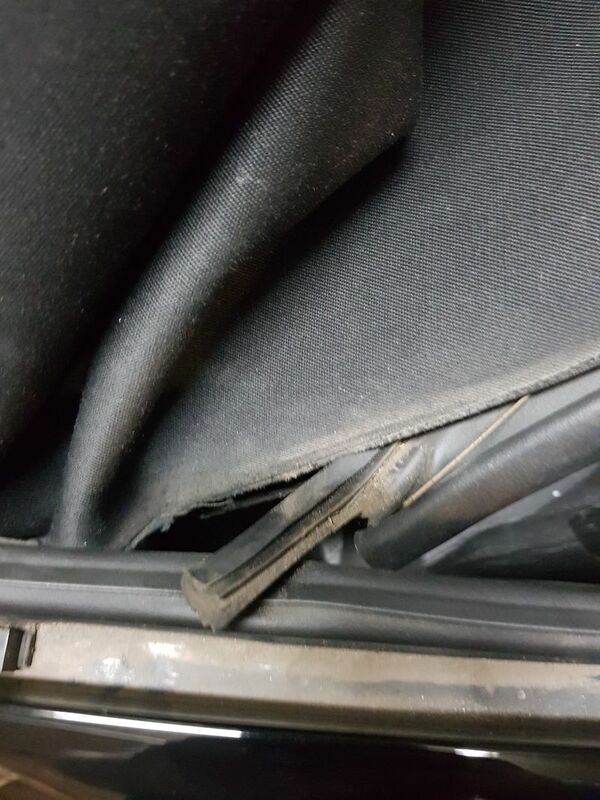 I used a bent pick to get in under the corner and just carefully levered it out. 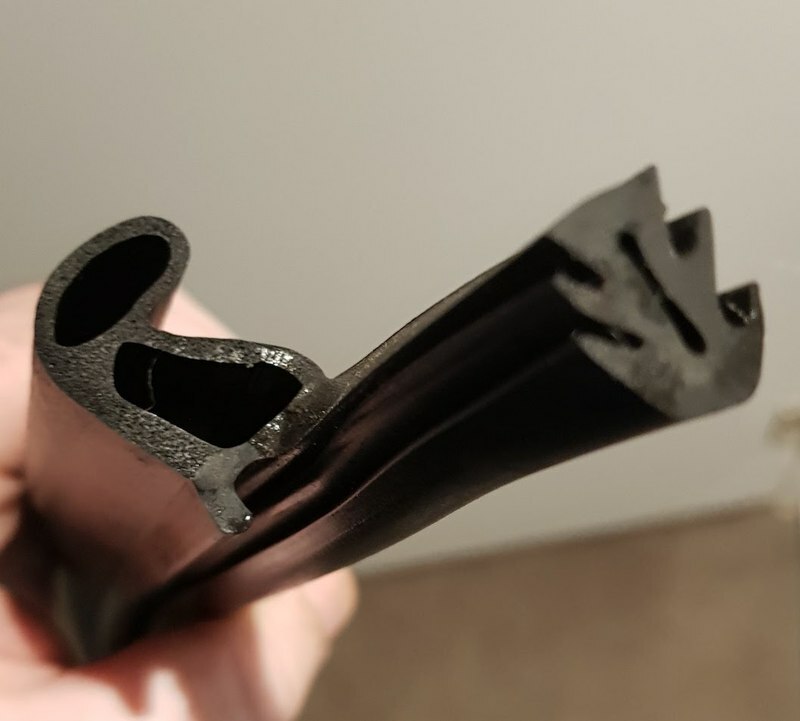 Here you can see the profile of the rubber, and how the inserted strip runs further than the bit you can see against the top. I coated all of the inserted piece with dish soap to make it easier to insert again later. Last edited by oldskool73; 04-29-2018 at 09:40 AM. Now we can free the canvas from the old fixings. There's 3 attachments, 1 glued and 2 taped. The glued section is a small flap of material that's inserted into the rear retainer and glues to the main canvas. Mine was completely unstuck. I'm not sure if this has any mechanical use in holding the top down, my guess is it's more a weather strip than anything else? 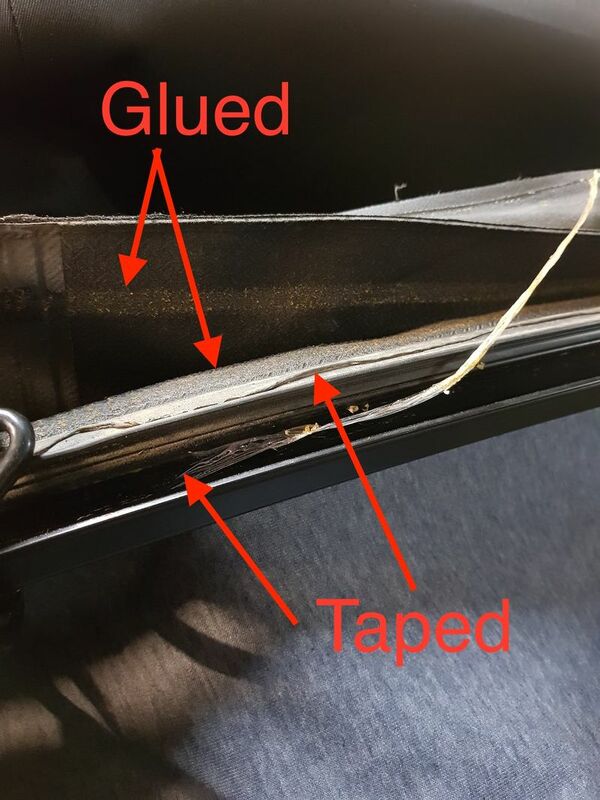 The main top is first taped to a flexible piece, then folds over it into the same channel that the rubber we removed runs in, and has another strip of tape holding it in place in there. The original tape seems thinner than the 3M stuff, more like simple sticky tape, but the extra width didn't seem to matter in putting it back together. Now you just need to peel off the red backing tapes and carefully pull and stick the top back into the proper position (I followed the original fold creases as best I could). 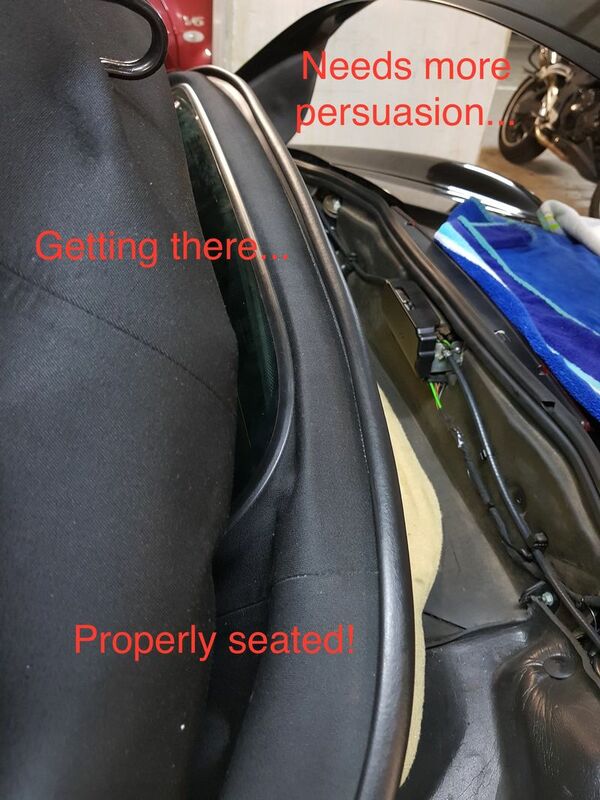 I did find the glass window to be a bit of a pain here, you might need to manoeuvre it around a bit to get the slack that the top needs to fit correctly. I'd imagine the plastic window would make this step easier. ...and checking from underneath as well, as there's a small flap on the rubber that should slightly overlap the lower rim. ...And that's it! Only took an hour or two to fix. I gave it overnight with the top closed but unlatched for the tape to take, just in case. The final result... no more sagging... just needs a good clean now! Outstanding post! Let it be example of how all DIY threads should be presented. A lot of the soft top stuff remains a mystery it’s great to see it deconstructed so that the layman can understand. Nothing to be afraid of if you have the knowledge. Great write up. I have the same problem, and attempted a ham-handed fix with fabric adhesive - basically just putting a bead of glue on the canvas and using a plastic pry tool to jam it back under the rubber. I got improvement, but not the professional type result you did. That's my project for this summer when the weather gets warmer thanks for taking the time to share it with us. 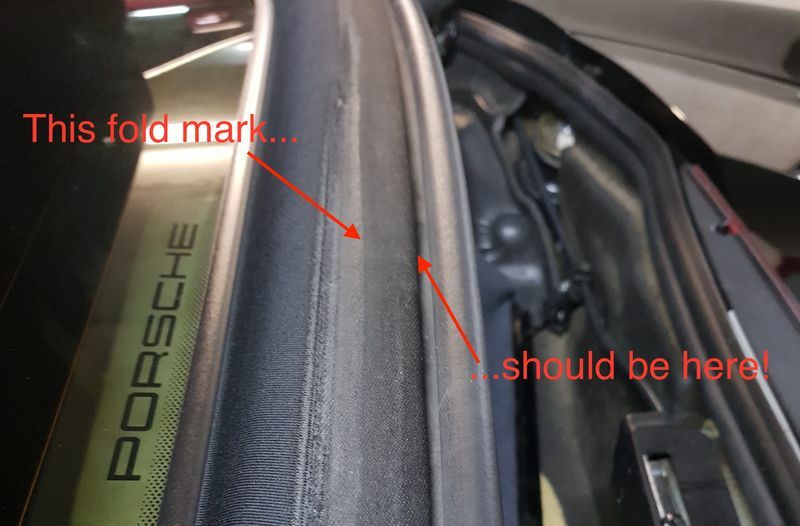 Is the tape holding? Also, how did you pull the fabric so that it is stretched and tight? 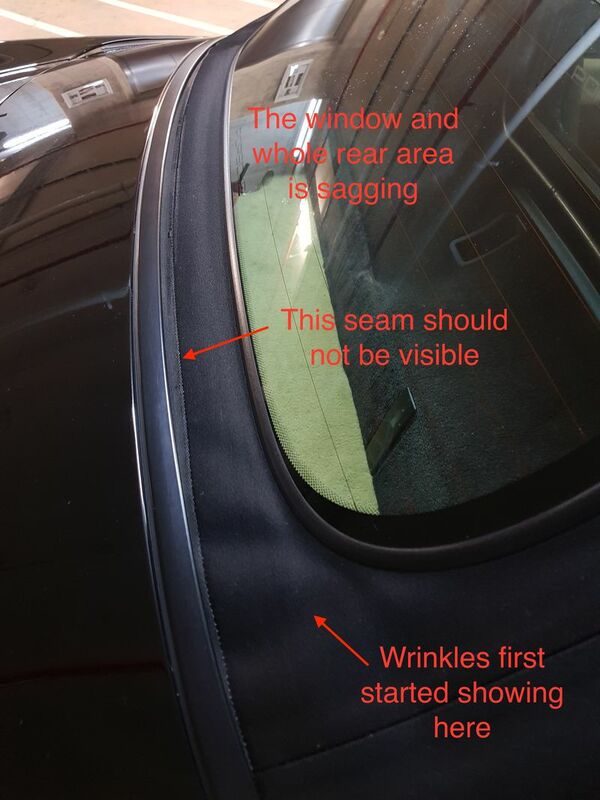 I have the same issue - in my case the car has been baking in the sun from being parked outside during the day and the tape kind of melted. I was able to successfully do the first part - which was removal and clean up of adhesive tape. 1. Tape doesn't seem to really want to stick to canvas. Did you use any tape primer? 2. 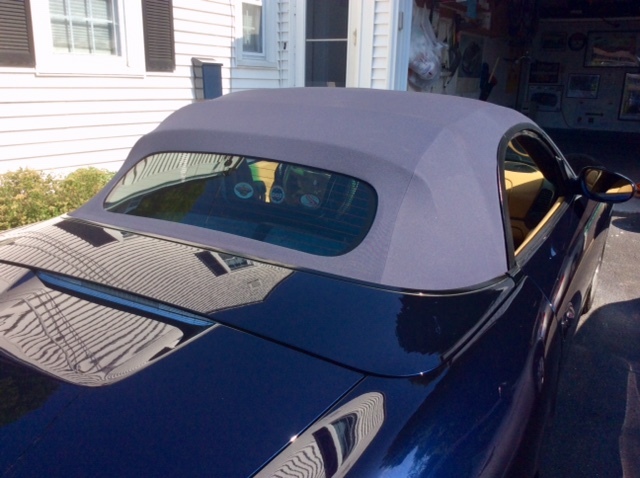 The top cover interferes in re-installation of the fabric - did you remove it? 3. When doing myself, it is near impossible to stretch the fabric so the top is misaligned on one side (it's ok where i started, but short by 1" on the side I finished). It much worse now than before I attempted the fix! Any suggestions / input is appreciated. 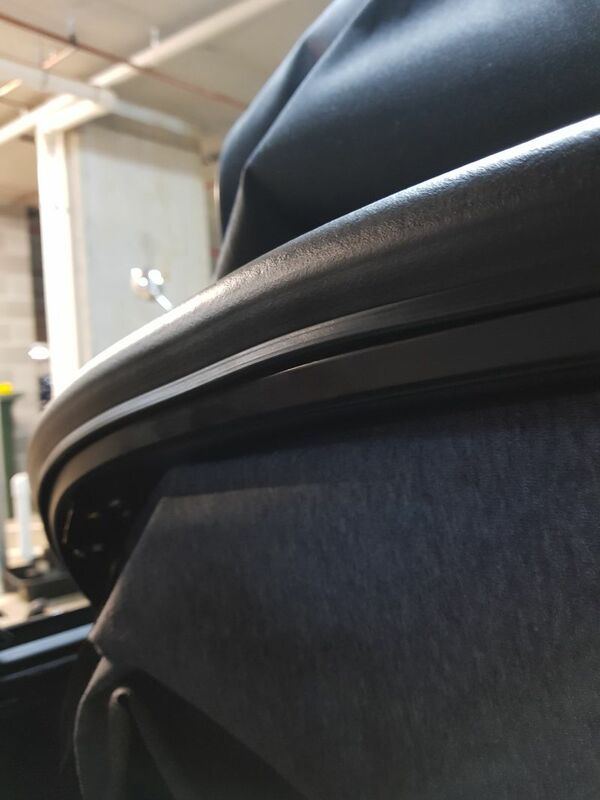 Since my top and headliner had other issues as well (severe crease/wear marks, and headliner front lip separated) I decided to have the whole top replaced. Pretty happy with the result! Mine's holding up well so far. The only thing I'd do differently maybe is use a proper canvas glue for the flap that's glued originally, as the tape doesn't seem to have worked there very well. 1. 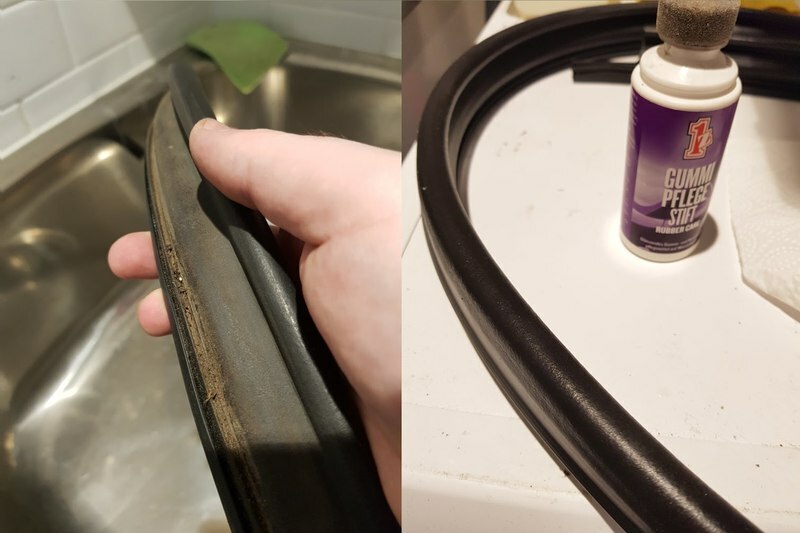 No, didn't use anything but the tape, with the top in service position I found there wasn't really any tension on it to pull it free of the tape anyway, and once you have the rubber in there that's gonna hold it in as well. TBH I think the rubber does most of the work, the tape just helps grip it in there. 2. Guess you mean the 'clamshell' part? Can't remember TBH, looking at the photos no, but it's really easy to do, just undo the 6 nuts underneath and lift it off, so if you think it'd help just do it. 3. Again with it in service position I didn't really have any tension on it, so didn't need to 'stretch' it at all. The only thing that made it difficult was the glass window moving around, so had to put a hand in from the back and push it into various positions to get the canvas to move around right. Maybe you need to try putting the top a bit more 'open' or holding the bow a bit higher when adding the tape or something, to help relieve any tension on the canvas? I didn't have to 'stretch' it at all, it was more just fiddly getting it lined up and stuck neatly into the channel. On the bright side, it's not too much of a hassle (other than the cost of the tape) to pull it out and try again until you're happy with it. The 3M adhesive works better than the tape IMO. Folks are scared that they’ll make hey mess with the adhesive but if you spray it on a paper plate and then apply it top the top with a foam paintbrush it works pretty well and is easy to control. I used a canvas epoxy that quick dries where the glue is and held it there for one hour with vise clips, and then I put the epoxy the rest of the way across where is say's glue on the top picture and then I pulled the top until it fitted in the bottom grove, then installed the rubber using a tool to install screens to set the rubber in place let it set overnight and the next day it was all good and still is.